En plena campaña electoral a la presidencia se descubre la presencia de cinco delincuentes en las oficinas del Watergate. Los periodistas del "Washington Post" Carl Bernstein y Bob Woodward son encargados de realizar el reportaje y empiezan a encontrar misteriosas conexiones entre los delincuentes e influyentes personalidades gubernamentales. 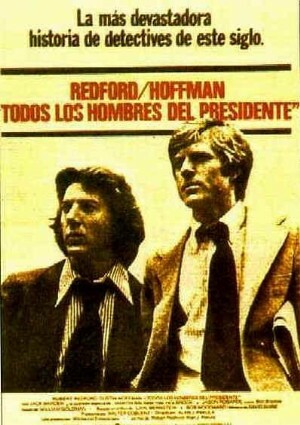 Dustin Hoffman, Robert Redford, Jack Warden, Martin Bal Sam, Hal Holbrook, Jason Robards, Jane Alexander, Meredith Baxter, Ned Beatty, Stephen Collins, Penny Fuller, John McMartin, Robert Walden, Frank Wills, F. Murray Abraham, David Arkin, Henry Calvert, Dominic Chianese, Bryan Clark, Nicolas Coster, Lindsay Crouse, Valerie Curtin, Gene Dynarski, Nat Esformes, Ron Hale, Richard Herd, Polly Holliday, James Karen, Paul Lambert, Frank Latimore, Gene Lindsey, Anthony Mannino, Allyn Ann McLerie, James Murtaugh, John O'Leary, Jess Osuna, Neva Patterson, George Pentecost, Penny Peyser, Joshua Shelley, Sloane Shelton, Lelan Smith, Jaye Stewart, Ralph Williams, George Wyner, Leroy Aarons, Donnlynn Bennett, Stanley Clay, Carol Coggin, Laurence Covington, John Devlin, John Furlong, Sidney Ganis, Amy Grossman, Cynthia Herbst, Basil Hoffman, Mark Holtzman, Jamie Smith Jackson, Barbara Litsky, Doug Llewelyn, Jeff MacKay, Irwin Marcus, Greg Martin, Ron Menchine, Christopher Murray, Jess Nadelman, Noreen Nielson, Florence Pepper, Barbara Perlman, Louis Quinn, Peter Salim, Shawn Shea, Marvin Smith, Pam Trager, Carol Trost, Richard Venture, Bill Willens, Wendell Wright, Cara Duff-MacCormick. Alan J. Pakula (Dirección), Gordon Willis (Fotografía), Bob Woodward, Carl Bernstein, William Goldman (Guión), David Shire (Música).